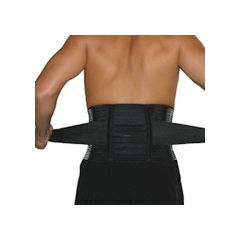 Provides maximum back and abdominal support. Overlapping upper and lower straps, as well as two side straps for a customized fit. CS-49227 - Size Small/Medium: up to 37"
Does not give the support I was hoping for. I have a hard brace from the hospital that is uncomfortable to wear and I was hoping to get something that was flexible but still gave some lower back support. by Jeff from Puyallup, wa. Is the X-Large size sufficient for a male with a 50" waist or is there another model more appropriate? What kind of fasteners are used on this product - buckles, Velcro, or what?